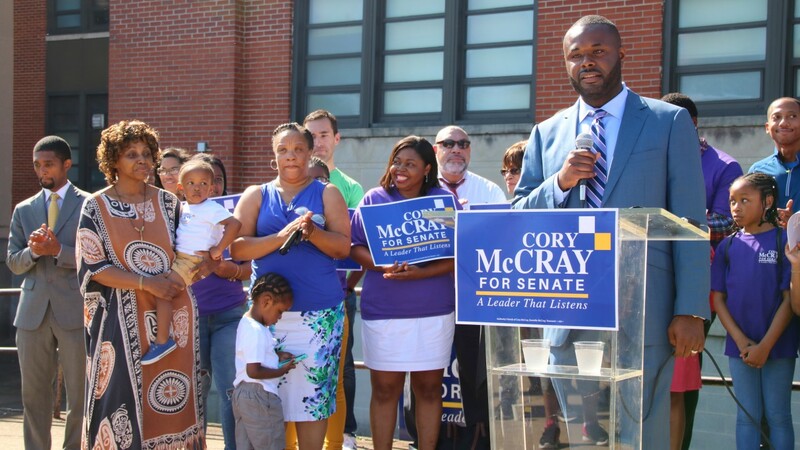 City Councilman Brandon Scott struck a feisty note at the kick-off of first-term delegate Cory McCray’s Senate campaign, declaring it high time Baltimore’s entrenched politicians step out of the way for young change-makers like the 34-year-old McCray. 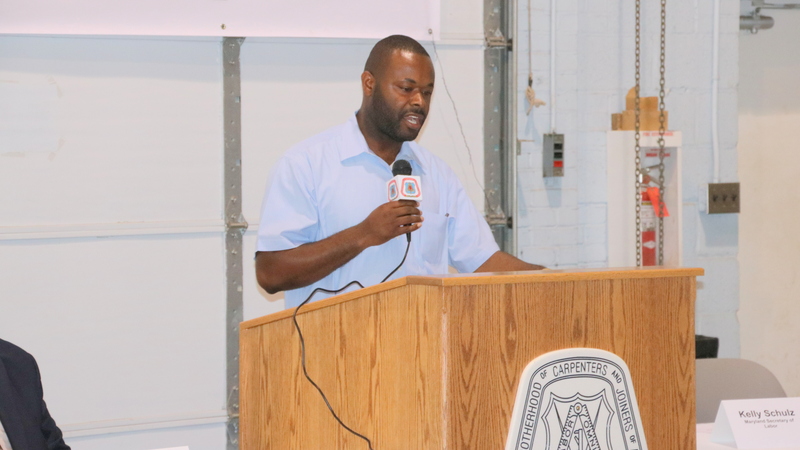 The unseen presence of Sen. Nathaniel J. McFadden – the 45th District incumbent McCray hopes to topple – hovered likewise over the crowd, providing a sober counterpoint to the speakers’ optimism. After 35 years in elected office, leading up to his current Senate president pro tem position near the top of the Annapolis pecking order, the 71-year-old McFadden has powerful allies. 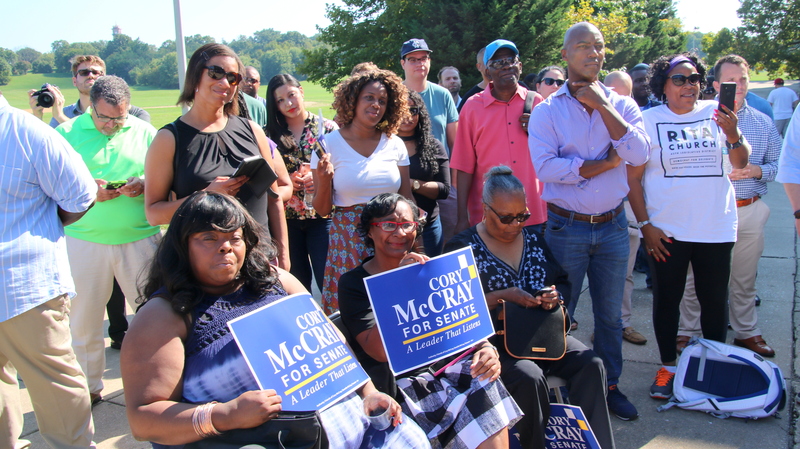 Taking him on in a state where Democratic leaders maintain tight control on the levers of power and look askance at those who “jump the line” could be perilous, McCray acknowledged. “I know the risk today but I tell you, I will make it worth it,” he said, after thanking by name the politicians who stood with him. They included, in addition to Scott, councilmen Bill Henry, John Bullock, Zeke Cohen, Councilwoman Shannon Sneed and Del. Patrick G. Young, Jr., of District 44-B, Baltimore County. McCray is only the latest upstart challenging an incumbent in next year’s Democratic primary. Attempting an even bigger leap is SEIU union leader Aletheia McCaskill, who is taking on Sen. Shirley Nathan-Pulliam in the 44th district. “Don’t just listen to me. Walk with me. Support me. I need you to pray that good prayer,” McCaskill, chair of SEIU’s REGIONAL C.O.P.E., said at her announcement event earlier this month. In addition to financial support from her union base, McCaskill may have another resource to draw on in the match-up – voters unfamiliar with the incumbent in the recently redistricted 44th, which now includes voters from Baltimore County. 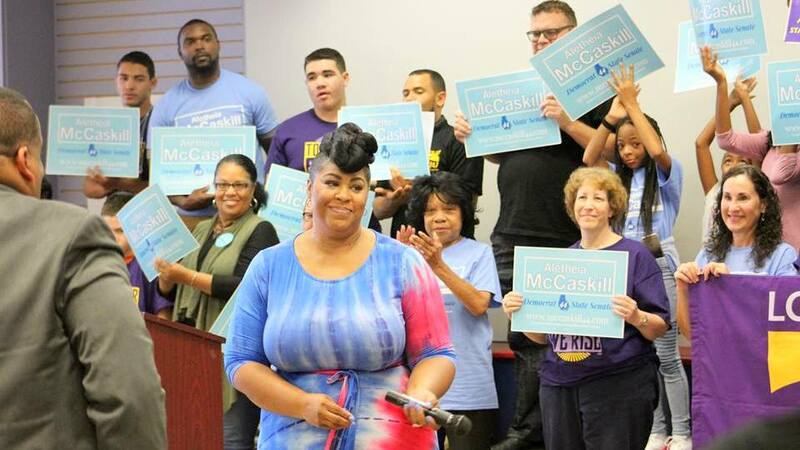 The owner of a daycare business, McCaskill was an active street team organizer in the last election, motivated in part by her commitment to Baltimore passing a $15 minimum wage bill. Also squaring up against an entrenched officeholder in the June 26 primary is Del. Antonio Hayes, who is vying for Sen. Barbara Robinson’s 40th district seat. Likewise Del. Mary Washington is taking on a fierce opponent in Sen. Joan Carter Conway. Conway, representing the 43rd district, has served in the Senate since 1996 and chairs the Senate Education, Health and Environmental Affairs Committee. One Senate seat being closely watched is the 41st district, where the incumbent senator, Nathaniel T. Oaks, is currently facing federal indictment. Oaks has pleaded not guilty to nine counts in connection with allegations that he was recorded by the FBI accepting $15,000 in cash to use his position to help a development project. No one has yet filed or announced plans to run against him. But mostly, through a story he will likely re-tell many times on the stump, McCray portrayed himself as an unlikely success story with a personal connection to the city’s struggles. “As a juvenile, I was charged for a crime as an adult. I would spend my 18th birthday at Baltimore City jail,” he said. But with support from his mother and a union apprenticeship, he said, he got on a path that led to him becoming a licensed electrician, an entrepreneur, a married father of four and a member of the Maryland House of Delegates. “It was my mom who looked me straight in the eye . . . and said ‘I’m always going to believe in you until you believe in yourself,’” he said.